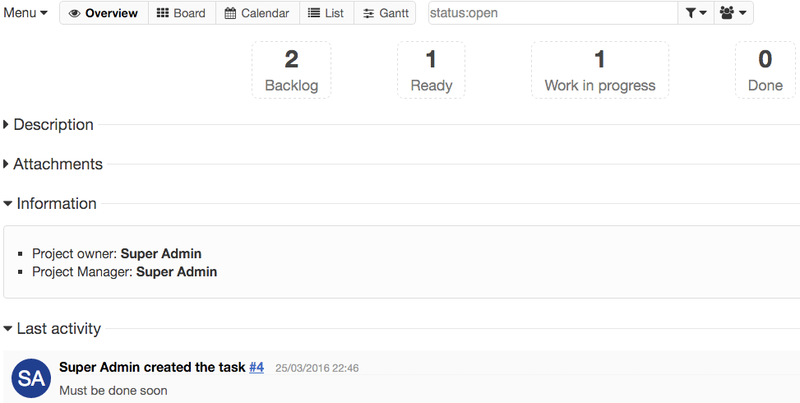 For each project, tasks can be visualized with several views: Board, Calendar, List and Gantt. Each view shows the result of the filter box at the top. 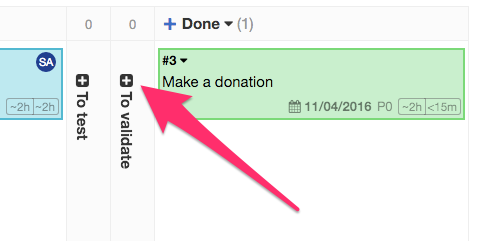 With this view, you can drag and drop tasks between columns easily. You can also use the keyboard shortcut “v b” to switch to the board view. Tasks with a shadow are recently modified. When the task limit is reached for a column, the background becomes red. That means there are too many tasks in progress at the same time. With this view, all results of your search are displayed in a table. You can also use the keyboard shortcut “v l” to switch to the list view. View the description of the project. Attach and upload documents to the project. View list of project members. View the last activities of the project. 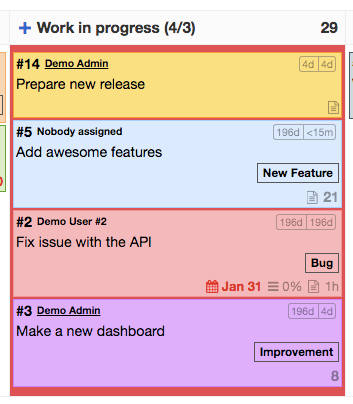 Tasks on the board can be displayed in collapsed or in expanded mode. Switching from one view to another can be done with the keyboard shortcut “s” or by using the drop-down menu on the left. If the task is assigned to someone, the initials of the person are shown next to the task number. If the task title is too long, you can put your mouse over the task to show a tooltip with the full title. 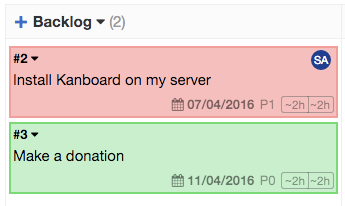 When the board cannot fit on your screen, a horizontal scroll bar will appear at the bottom. 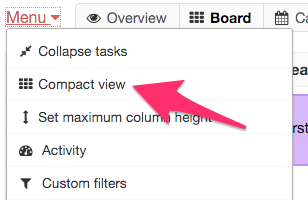 However, it’s possible to switch to the compact the view to display all columns in your screen. Switching between horizontal scrolling and compact view can be done with the keyboard shortcut “c” or by using the drop-down menu on the top left. To show the column again, click on the “plus icon”.